On Sept. 11, 2001, the landing gear assembly of one of the planes crashed through the roof of 45-47 Park Place, then a Burlington Coat Factory. Park Place is about three blocks north of the World Trade Center site, and 51 Park Place was part of a plan by a developer to create a mosque and community center. The landing gear component is about five feet high, three feet wide and about 18 inches deep, Mr. Browne said. It was wedged between the two buildings, where it remained “out of sight and out of mind for over a decade,” Mr. Browne said. Wasn't this the "scene of the largest crime" in US history? How come this wasn't found when all the agencies investigated(?) this horrible crime? Somebody forgot to put this on the high speed barge to Japan? They were able to find one of the hijackers passport, but didn't find this three feet by five feet airplane part! Doesn't smell right to me! There has to be another investigation, including investigating the investigators and their leaders. I challenge the corporate rubber stamp press to show some courage and look into this travesty. Thinker on Fri, 04/26/2013 - 9:04pm. Looks like simply skidded across the roof of one of the buildings and tumbled down into the crack between, and it's not like people spend much time looking down the tiny cracks between buildings. So it's hardly surprising that it took this long to be discovered. pretty much the opposite of the passport story. Pavlovian Dogcatcher on Fri, 04/26/2013 - 10:57pm. The buildings were hit by planes so it fits (perhaps) that a piece of plane hit the roof of a building, skidded off the edge and fell into a crevice. Those who criticise this will be branded crazies who believe the planes were holograms and other nonsense. The valid question here is: how did a piece of metal from a plane that buried itself deep in a building, manage to travel this large distance laterally and not fall prey to gravity? 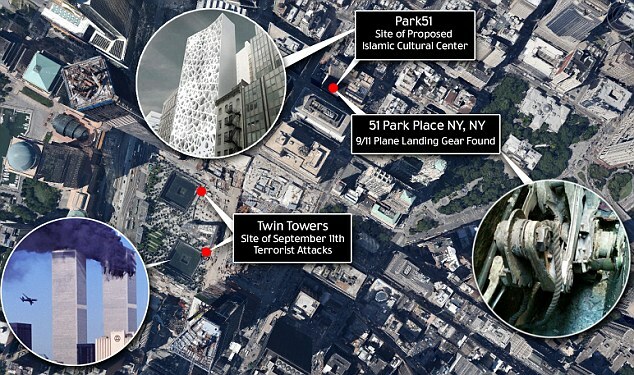 Other plane parts were found in the roads directly below the towers, which speaks more to gravity. Simple Truths on Sat, 04/27/2013 - 4:00am. Parts had significant exit velocity. Large parts landed blocks away. Specifically engines and gear. jkeogh on Sat, 04/27/2013 - 4:30am. .....at freefall speed in it's footprint (impossible, according to 1700 architects, see www.ae911truth.org), but not hot enough to burn rope or a passport? Come on! Wake up American people! Apathy and unconscious incompetence will destroy our freedom. Thinker on Fri, 04/26/2013 - 9:35pm. Joe on Sat, 04/27/2013 - 5:03pm. Look at the photographs of the landing gear, why is there a rope attached to the landing gear? airplane parts/serial numbers of all the recovered 9/11 airplane debris, not once in 11 years have any been released. Now 11 years later, they find this airplane part and say the part has a serial number and the word Boeing on it. I wasn't aware Boeing uses "rope" in their aiplane landing gears. We will never know the real criminals of 9/11 or should I say they will never be made accountable for their crimes. The American people can't handle the "TRUTH". SCAFFOLDRIDER on Sun, 04/28/2013 - 6:09am. I use rope to pull things. Is it possible that rope was used in the recovery of the part? Is it suspicious that rope is in the photograph? Countless requests? Can you give us a few FOIA (or other) request numbers/dates/agencies? If you have photos, please post them. I am sure there is no law preventing you from doing so. jkeogh on Sun, 04/28/2013 - 6:25am. JFK asked me to take a look at your photos. Here's the best possible identification I can give you of what parts you are looking at and from where they originate within an aircraft. But of course, without the parts in-hand, I can't tell you SPECIFICALLY what engine model or what aircraft type they come from. Of the several military aircraft crash investigations I was involved in years ago, ya really have to 'untangle' and 'lay out' and 'measure ' and 'check partnos, sernos' etc to say SPECIFICALLY where thus and such part came from. Photos 059/060 - A mid to aft compressor rotor disk, missing its inner disk bore's counter-centrifugal balance land - the broach slots at the outer rim of this disk into which the blades are loaded indicates 'compressor mid-aft stage'. Photo 61 - Zinc chromate painted (light green) part indicates it comes from somewheres within the aircraft's airframe mechanisms. Photo 63 - Fan rotor/compressor rotor/low pressure turbine rotor shaft. Photo 66 - Appears to be some sort of thermal blanketed air duct. Photo 68 - Appears to be a section of the lower landing gear strut w/ wheel truck torque link still attached. Photos 69 thru 72 - Assuming these are all the same as Photo 68 - section of landing gear. Photo 73 - I simply don't know. Photos 74 & 75 - either Intermediate Pressure Fan stator casing OR mid to aft compressor stator casing w/vanes. Photo 546 - Caulking gun w/orange handle. Computer hard card. Rain water drain pipe??? Photos 548 & 559 - nothing specific discernable to my eyes. Thanks SO MUCH for sharing these photos with all of us. 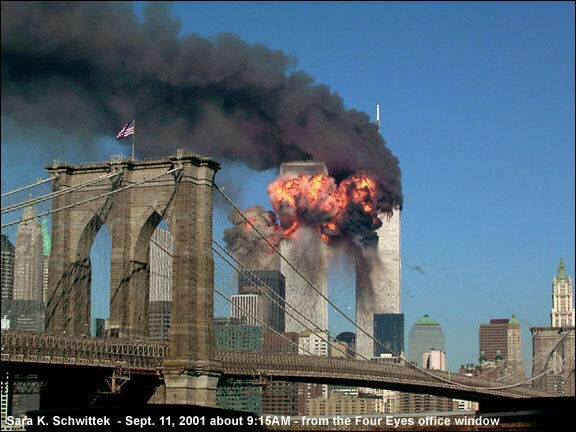 Kinda/sorta NICE to look at "fresh 9-11" stuff - well, at least this is the first time I've laid my eyes on these photos. Got to the point I was good and SICK & TIRED of looking a wreckage photos from here, there and everywhere else! SCAFFOLDRIDER on Sun, 04/28/2013 - 8:20am. Was it just tangled up in the plane part, draped over, like it fell to the part later or was it purposely tied around it? How long was the rope? What kind of rope? Sisal? Nylon? Poly? Is that casting number specific to 767 or could it be from a different model such as 757, 747 or 737? kawika on Sun, 04/28/2013 - 10:57am. Looks like a steel cable to me. I've no clue if such cables are used in landing gears, but it hardly seems unlikely. The serial number on the other hand is an important issue, but it's not like we can expect and honest answer on that if it doesn't match. Pavlovian Dogcatcher on Mon, 04/29/2013 - 3:02am. I read in one report that, because it was found next to the planned Muslim community center--the so-called '9/11 mosque'--police are taking seriously the possibility that the piece was planted there, possibly as some kind of taunt by Islamophobes against the community center. We'll see how these and other reports pan out. When it comes to the explosive force that resulted in projectiles being found blocks away, we've already got plenty of evidence on that. rm on Sun, 04/28/2013 - 10:43pm. Parts of the WTC buildings were not found blocks away (large parts landed up to 600ft away, and exited the buildings ~100mph), the aircraft parts were found blocks away because their initial velocity was around 500mph and they passed through the buildings with enough exit velocity to land where they did. There is plenty of video and photographic evidence. Interested people can calculate the exit velocity exactly based on the starting and landing locations. Why do some people assume it's planted without doing the math first? jkeogh on Sun, 04/28/2013 - 10:52pm. I'm not assuming anything, nor am I suggesting anyone accept uncritically the statements of the NYPD's Ray Kelly, or the New York Post (apparently the source of the lawyer's quote). I just thought it might be helpful to know what else is being speculated about at this point. rm on Sun, 04/28/2013 - 11:28pm. I don't see why someone would need to lower a part like that carefully, dropping it would suffice. It's location is close to the locations where other UA 175 parts landed. jkeogh on Sun, 04/28/2013 - 11:45pm.